« Legal costs from Paddy McKillen case in 2010 and 2011 still not established. For the first time on Monday last, we learned via RTE of the Top 30 borrowers at the Irish Nationwide Building Society. There have been a few private messages received requesting a comparison with the top borrowers at Anglo Irish Bank, and this is a brief blogpost setting out both. The source of the Anglo top borrowers is Simon Carswell’s book Anglo Republic. Here are the Top 23 at Anglo (Simon says Top 20) ar November 2007. Simon sorts his league table by loan approved amount, but the table below shows amount drawn down, which seems more relevant. 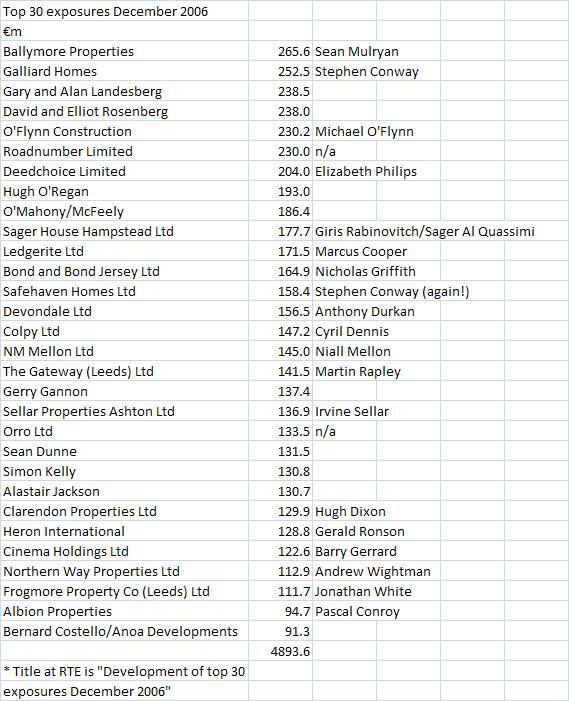 Paddy McKillen’s Belfast Office Properties had approvals of over €400m but had only drawn down €140m. There is very little intersection between the two lists, just three borrowers in fact. 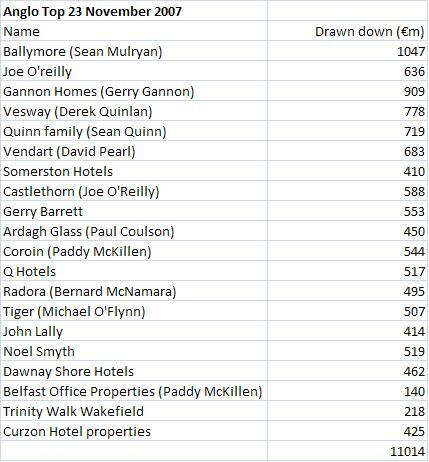 Ballymore which between the two owed €1,312.6m, Gerry Gannon €1,046,4 and Michael O’Flynn and companies €737.2m. Remember though that AIB and Bank of Ireland also had €30bn of loans acquired by NAMA. @DYLE, you may be right but Sean Quinn built up his stake in Anglo via Contracts for Difference and it was only when there were margin calls that his borrowings with Anglo apparently soared, and that may mostly have been in 2008. Remember the list above is at November 2007. @Jeremy, thanks, it seems that Colpy Limited which is not registered in the UK or Ireland is Cyril Dennis’s company. Will update the list above.